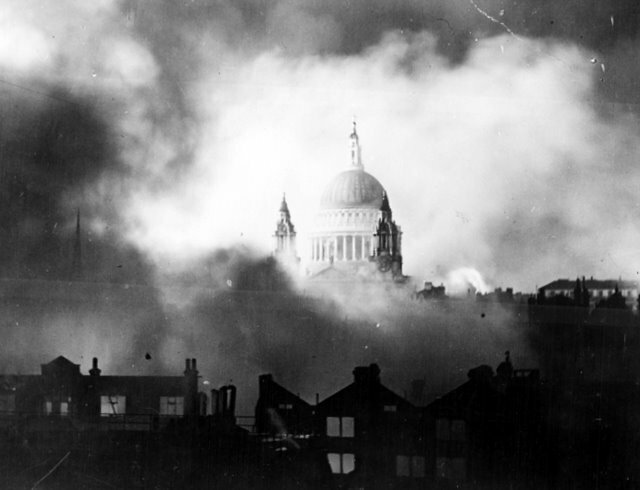 The London Blitz began in the afternoon of 7 September 1940 with the first mass daylight air raid on the docks area. During the following night another wave of bombers guided by the fires set by the first assault continued bombing the city until 4:30 the following morning. 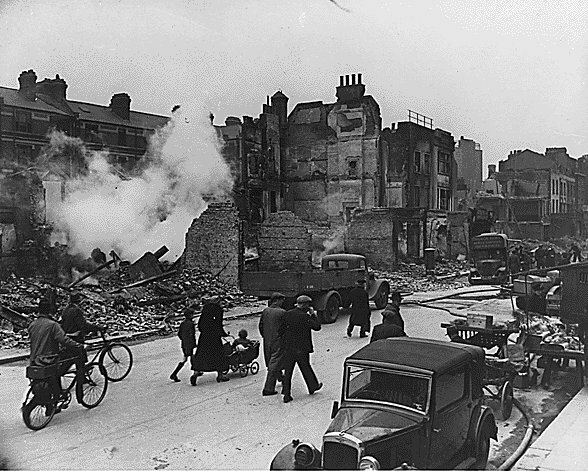 For the next consecutive 57 days, London was bombed either during the day or night, and the intensive night bombing continued until May 11, 1941. The German military doctrine of speed and surprise was described as Blitzkrieg, literally lightning war, from which the British use of blitz was derived. 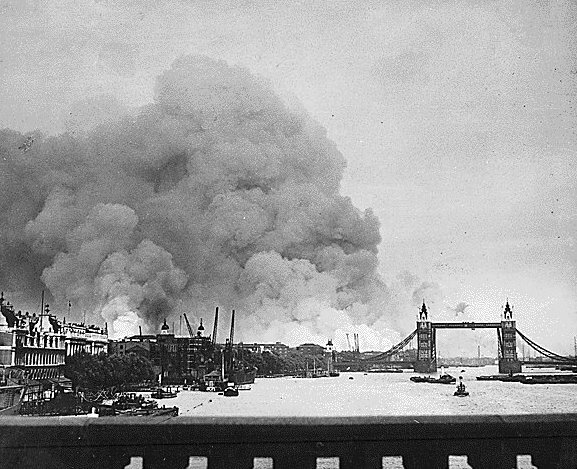 While German air-supported attacks on Poland, France, the Netherlands and other countries may be described as blitzkrieg, the prolonged strategic bombing of London did not fit the term. The term Blitzkrieg seems to have been more common at first, but after a month or so it was replaced by Blitz. I think this is significant, because it shows that the British didn’t think of the Blitz as something fundamentally different from blitzkrieg. It was the blitzkrieg, as applied to the attempted conquest of Britain — which, being separated from the Continent by the English Channel, obviously wasn’t going to play out in exactly the same way as it did in Poland and the West. So, in the Spectator’s view, London was not being bombed just to kill civilians or undermine morale, but to create chaos at a critical place and a critical time. A landing in Kent or Sussex could be only days away, and panic in London would greatly aid the invaders. A view widely accepted both in Britain and Germany before the war was that indiscriminate bombing of cities would quickly undermine the morale of the civilian population, spreading confusion and anarchy. In fact, nothing of a kind happened during the Blitz; people quickly learned how to continue with their lives despite the bombing and destruction. Destroy the defending air force and gain air superiority. In May 1940, the elimination of the Belgian Air Force in the first few hours of fighting, for example. From August, the Battle of Britain (though of course this was a German defeat). Attack cities and communications behind the front line from the air and disrupt the defence. In May, the bombardment of Rotterdam; also the masses of refugees streaming away from the front. In September, the Blitz. Advance rapidly with mobile ground and airborne forces to encircle and defeat the defending forces. In May/June, the Battle of France, including Sedan and the Sichelschnitt. In September, Operation Sealion. So blitz is not a corruption of blitzkrieg as the latter term was understood in Britain at the time. Of course, as the Blitz wore on, autumn turned into winter and people realised that Hitler wasn’t coming — yet — the phrase took on a life of its own and came to refer exclusively to the aerial bombardment of cities by the Luftwaffe. But useful though this definition is, it unfortunately detaches the Blitz from the bigger picture and obscures the continuities and connections between it and the Battle of Britain, and Sealion. I’ve disregarded the question of whether any of this bears any relation to the “real” blitzkrieg, or indeed the actual course of events; I’m interested in what people thought was happening more than what was actually going on. But it turns out that blitzkrieg is itself a problematic concept, and it’s problematic in quite an interesting way. I’ll examine that in a later post. one of the most devastating raids on 29 December 1940. A. J. P. Taylor, English History 1914-1945 (Oxford: Oxford University Press, 1992 ), 501. Daily Telegraph, 9 September 1940, p. 1; quoted in OED entry for ?blitz?. A decisive hour, Spectator, 13 September 1940, 260. Emphasis in original. The two blockades, New Statesman, 17 August 1940, 149. Manchester Guardian, 18 September 1940, p. 4. Emphasis added.